Augustin-Jean Fresnel (pronounced [freɪ'nel] or fray-NELL in American English, [fʁɛ'nɛl] in French) (May 10, 1788 – July 14, 1827), was a French physicist who by his theories and discoveries advanced support for the wave theory of light. He invented a specialized lens that was used to intensify the light in lighthouses. Fresnel was one of four children of an architect, born at Broglie (Eure) in Normandy. His early progress in learning was slow, and he could barely read when he was eight years old. But at age nine, he is said to have made improvements to some toy weapons that turned them into dangerous armaments, and which were, as a result, proscribed by the elders of the community in which he lived. At thirteen, he entered the École Centrale in Caen, where he was instructed by an illustrious and well-qualified roster of teachers. 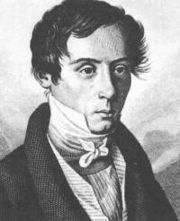 At sixteen and a half, he transferred to the École Polytechnique, where he attracted the attention of famed mathematician Adrien-Marie Legendre, who as an examiner, noticed a novel solution for a geometric problem provided by Fresnel on an exam. This encouraged Fresnel in his studies and his approach to mathematics and science. From there he went to the École des Ponts et Chaussées where he studied engineering. After graduation, Fresnel served as an engineer successively in the departments of Vendée, Drôme, and Ille-et-Vilaine, primarily in the departments of road construction. In 1814, because he was a supporter of the French monarchy, he lost his appointment on Napoleon's return to power. In 1815, he joined the armed services of the royalist forces, but the strain on his constitution did not permit him to stay long in that capacity. On the second restoration of the monarchy, Fresnel obtained a post as engineer for the roads of Paris. His researches in optics appear to have been begun about the year 1814, when he prepared a paper on the aberration of light, which, however, was not published because its details appeared to have already been brought to light by earlier investigators. At that time, he began studying the phenomenon called polarized light, which would be the subject of many of his later researches and discoveries. In 1818, he wrote a memoir on diffraction for which in the ensuing year he received the prize of the Académie des Sciences at Paris. During this time, he also began investigations on a lens assembled from prisms of glass for use as an amplifier of light in lighthouses. He demonstrated this lens and its light intensification powers in 1821, when it was used to establish the distances between points on the British and French sides of the English Channel. Fresnel and Francois Arago developed a brighter lamp, now called the Fresnel lamp, to use in conjunction with the improved lens. In 1822, he presented a memoir before the French Academy of Sciences on his new system and its use in lighthouses, generously offering credit to other scientists who had described similar systems. In 1823, his lamp and lens was installed in the first lighthouse, the construction of which was underwritten by the French government. Fresnel was appointed secretary of lighthouses for the French government, a post which he held concurrently with his engineering position. In the same year, Fresnel was unanimously elected a member of the French Academy of Sciences, and in 1825, he became a foreign member of the Royal Society of London. "I could have wished to live longer, because I perceive that there are in the inexhaustible range of science, a great number of questions of public utility, of which, perhaps, I might have had the happiness of finding the solution" (Arago, 1859, p. 278). The Royal Society of London presented him with the Rumford Medal, which he received while in the last stages of tuberculosis. He died in 1827. Fresnel was of a frail constitution, and had a meek manner that was not overbearing. It was said that if one of his colleagues was shown to have committed a transgression as a public servant, his mild manner would be replaced by swift outrage. He was generally self-effacing, and far more interested in the pursuit of science and the public welfare than in fame. As he wrote to Young in 1824, in him "that sensibility, or that vanity, which people call love of glory" had been blunted. "All the compliments," he says, "that I have received from Arago, Laplace, and Biot never gave me so much pleasure as the discovery of a theoretic truth, or the confirmation of a calculation by experiment." The wave theory of light, which has its roots as far back as Aristotle, holds that light is a continuous series of impulses transmitted in a manner similar to the way sound is transmitted through the air. Some scientists, including Isaac Newton, believed that light was composed of moving particles that impacted the eye, a view quite different from the wave theory. Waves interfere with each other in a distinct way that can be detected. Fresnel's use of two plane mirrors of metal, forming with each other an angle of nearly 180°, allowed him to conclusively account for the phenomena of interference in accordance with the wave theory. Fresnel's discoveries and mathematical deductions, building on experimental work by Thomas Young, extended the wave theory of light to a large class of optical phenomena. Polarized light results from passing a beam of light through certain types of crystal. If the light is passed through a second crystal with the same properties and oriented at a distinct angle, it extinguished the light that was passed through the first crystal. Therefore, after its passage through the first crystal, the light is said to have been endowed with properties that characterize it as "polarized." In 1817, Thomas Young, who had already pointed out that light produces patterns that can be accounted for by wave interference, had proposed a small transverse component to light, while yet retaining a far larger longitudinal component similar to the way sound is transmitted (a compression and rarefaction of the air in the direction of the motion of the wave). Fresnel, by the year 1821, was able to show via mathematical methods that polarization could be explained only if light was entirely transverse (the modulations being perpendicular to the motion of the waves, similar to the up-and-down motion of waves in a pond that nevertheless travel outward along the surface of the water), with no longitudinal vibration whatsoever. Fresnel's research partner, Francois Arago, did not want to give his full support to this conclusion, because it radically departed from scientific thought at the time, thus leaving the credit with Fresnel, who published his findings. Fresnel's research showed further that the transverse nature of light waves could explain a phenomenon called double refraction, where a double image is produced when light passes through certain substances. This double-image effect was well known as a property of Icelandic feldspar, a crystalline mineral, but Fresnel showed the same property could be exhibited by compressed glass. "I had convinced myself," said Fresnel, "by a pure contemplation of the facts, that it was not possible to discover the true explanation of double refraction, without explaining, at the same time, the phenomena of polarization, which always goes along with it; and accordingly, it was after having found what mode of vibration constituted polarization, that I caught sight of the mechanical causes of double refraction." With Arago, Fresnel studied the laws of the interference of polarized rays. He predicted the existence of, and was able to generate what he characterized as circularly polarized light by means of a rhombus of glass, known as "Fresnel's rhomb," having obtuse angles of 126° and acute angles of 54°. Fresnel is perhaps best known as the inventor of the Fresnel lens, first adopted in lighthouses while he was a French commissioner of lighthouses. It had been proposed as early as the Eighteenth Century to carve a large glass lense into segments to reduce its weight. Fresnel submitted a memoir in July of 1822, entitled "On a New System of Illumination for Lighthouses," in which he clearly outlined the construction of such a lens, which he had already tried out in 1820. A similar system seems to have been devised by Sir David Brewster of England, who published his design in 1811. Be that as it may, Fresnel, who with Arago, had designed not only the lens, but a powerful lamp as well, is generally credited with the practical installation of the lens and lamp both of which bear his name, for use in lighthouses. As one commentator stated in 1850, while other scientists had suggested building lenses in separate pieces, "Fresnel…was the first who actually constructed a lens on that principle, and fully availed himself of the advantages which it affords; and he has subdivided, with such judgment, the whole surface of the lens into a center lens and concentric annular bands, and has so carefully determined the elements of curvature for each, that it does not seem likely that any improvement will soon be made in their construction" (Stevenson, 1850, p.17). Some lighthouses still use Fresnel lenses today, although an improved version has gradually replaced Fresnel's original design. ↑ Augustin-Jean Fresnel, "Sur la Double Ref.," Mem. Inst. 1826, p. 174. Arago, F. 1859. Biographies of Distinguished Scientific Men. Tr. W. Smyth, B. Powell, R. Grant. Boston: Ticknor and Fields. Stevenson, Alan. 1850. A Rudimentary Treatise on the History, Construction and Illumination of Lighthouses. J. Weale. 3-5,17-19,37,42-47. Whewell, William. 1857. History of the Inductive Sciences From the Earliest to the Present Time. London: John W. Parker and Son. This page was last modified on 6 December 2016, at 00:20.